Heather Bird was an exceptional person, not only a good firefighter but a good friend. Heather relished being a firefighter, every aspect of it and was always willing to teach new members anything she knew. Heather loved to cook and was studying to be a chef like her father Robert. Heather would give you a pat on the back or a kick in the pants when you needed it. 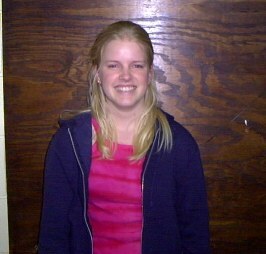 Heather helped others and interests outside the firehouse as well. She enjoyed fishing, NASCAR and swapping jokes. She was engaged to be married but was taken from us this past spring in a traffic accident while returning from a shift at the Vincennes Township Fire Department. Heather spent about a year with Clifty Six. She was the first "new" Cadet Advisor chosen and her fellow Advisors thought an annual award would be a way to honor Heather's memory. To recieve the award, a Cadet must be enthusiastic, willing to help others, determined to be a good firefighter and have interests in the community outside the firehouse. The period that a Cadet is evaluated for begins in May and ends the following May. The candidate must be an active Cadet during that period, but can be a recently appointed probationary firefighter, provided they were a Cadet who met the criteria listed above. Cadet Advisors nominate award candidates and must be prepared to defend their decision as this is not a popularity contest. The award is presented at the annual Cadet Cookout. 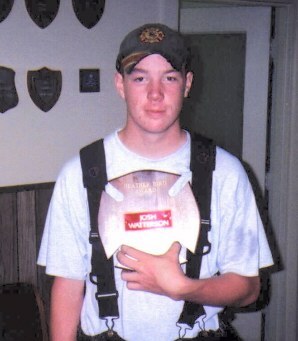 The recipient receives a wall plaque and their name is added to the wall plaque at Clifty Six's firehouse. Firefighter Lee received the first Heather Bird Memorial Mental Attitude Award on July 21, 2001 while she was making the transition from cadet to probationary firefighter. "Lil' Sis" has earned her Firefighter I/II certification and her EMT-B certification. She is active in her church group and played tennis in high school as well as being a cheerleader. Heather taught FF Lee about SCBA, search and rescue. Heather's Dad was present when the award was given. The 2002 Heather Bird Memorial Award for Positive Mental Attitude went to Explorer Chief J. Watterson. During the past year, Josh has been involved in a "School to Work" Program dividing his time between school and "job shadowing" Chief Horton of the City of Madison Volunteer Fire Dept. Josh has learned much about the paperwork involved with being Chief of a Fire Dept. Josh has also been instrumental in converting this program from a Cadet Program to an Explorer Post. Josh has remained highly motivated and motivated his peers without abusing his authority as Explorer Chief.